Both developers -- NRDC and Toll Brothers -- are sharing the same DATED Traffic Impact Study, prepared for Village 35 L.P. According to the NRDC website, the area has traffic counts of 37,272 vehicles a day on Route 35. The Traffic Impact Study predicts 2200+ cars will be on the site (retail and residential) at peak times. March 2017, Minding Middletown Steering Committee members, (from our group) meet with the town administrator to discuss the project. We requested a new traffic study using new data, not the original data. We are still waiting for the Township to release the study. The 118-acre Redevelopment project along with a newly planned redevelopment of Town Hall will converge around a hazardous retail island in the middle of the highway in an intersection that is already extremely dangerous. The traffic study does NOT take into account the additional traffic that comes with a destination grocer (Wegmans), additional retail on the island, and a new Middletown Municipal Complex that includes retail. It is important to study the drawings below. They lay-out how traffic patterns leading onto Route 35 will be altered (and, not altered) to accommodate the Circus Liquors Redevelopment Plan formerly known as Village 35. Given our first-hand experience driving on Rt 35 and local roads, along with the amount of cars in this area, we know these traffic plans are unrealistic. Hence, the need for a Traffic Engineer to Champion reality. Only an expert will be able to contest the revised traffic patterns proposed. Only an expert can review the ratings they have set forth in their study and counter them. The additional traffic will make Route 35 more congested and dangerous than it already is. Drivers avoiding traffic tie-ups will use neighborhood roads to travel home and to access the parkway. 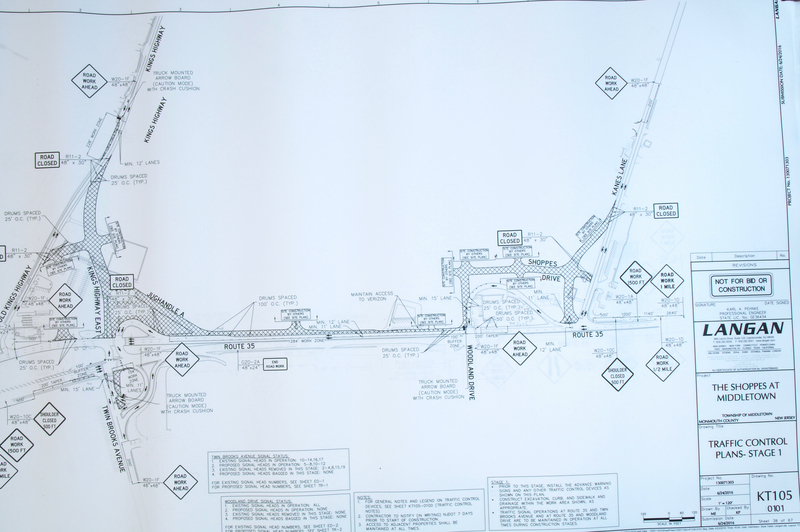 This image shows the proposed improvements to Kings Highway East and Twin Brooks Ave where they meet Rt 35. Download the image, or click to zoom in and explore the details, below. The 2016 Traffic Impact Study has an additional 2200 cars on the combined retail and residential site at peak hours. This is in addition to 37,272 vehicles a day on Rt 35. It does not take into account Wegmans or the new Town Municipal Center. 2200+ more cars on the site at peak hours. Note: There is a also a proposal to modify the Oak Hill Road / Chapel Hill Road intersection; however, the developer is asking for a waiver to exempt them from improving it. Image your experience during your weekday evening commute and during Saturday midday. ​Download the image, or click to zoom in and explore the details, below. ​Tindall Rd /Route 35 jug handle could back up to 3 times what it is now. Imagine trying to get out of your neighborhood streets or driveways into traffic from the new mall and 350 additional town homes unite the train station, and parkway, along with buses heading to and from school during peak hours. There are NO planned improvements to this jug handle even though the planning board engineer has stated that traffic build up at this jug handle could extend onto Route 35 and block the exiting of Kings Highway East onto Route 35 northbound. There are NO planned improvements to the Dunkin' Donuts Island. These developers are planning to build something larger than the Monmouth Mall and are trying to get around revising important intersections on Route 35 that are needed to accommodate all the additional traffic it will bring. There are already too many accidents at this location next the Dunkin' Donuts island as people cut through the parking lots and gas station and go straight across 35 to get to the jug handle, Burger King or the other local businesses there. ​Kings Hwy East (KHE) is designated a “Scenic Corridor” and will now be a commercial road with delivery trucks, late-night noise and traffic. The proposed Toll Bros. town homes will have their main ingress and egress directly across from the Kings Landing community entrance. NRDC is proposing to re-align (KHE) near Knollwood apartments and connect it across Route 35 with Twin Brooks Ave.
Twin Brooks Avenue is proposed to become 4 lanes instead of 2 lanes at Route 35 .This will be one of two main jug handles for the commercial portion of the development, the other being the Woodland Avenue jug handle. Both route 35 entrances to the Twin Brooks neighborhood will now be jug handles to the mall. Cut-through traffic: As more and more people try to escape the traffic on route 35, they will discover how to circumvent Route 35 and cut-through the Woodland, Twin Brooks, Spruce Drive and Brandywine neighborhoods. According to our traffic expert, this area will become the main cut through to the parkway because route 35 will be overburdened and will not function properly. Most of the new traffic will flow directly into residential neighborhoods if the proper improvements are not made to Route 35 or this project is not reduced to decrease traffic. The Chapel Hill/Oak Hill Rd at Route 35 intersection is already backed up and congested. With all the excess traffic on Kings Highway East and Route 35, drivers will look to go this route instead. The developer is looking for a waiver to avoid re-working this intersection. Additional back -ups will occur on Sleepy Hollow, Chapel Hill and East Roads as drivers try to navigate around newly congested areas. Red Hill Road and Kings Highway are both country roads that are the main access to the Garden State Parkway (GSP) and the train station for commuters and shoppers alike. With 2300 cars at peak hours, the traffic will be backed up at the Red Hill Rd /Kings Highway intersection making it difficult for drivers to get to work and schools. This excess traffic could cause unsafe conditions for school children walking to the Village School on Kings Highway as well. ​Area traffic issues - There are 250 proposed townhomes and 18 single-family homes on Taylor Lane (across from Target). With the proposed 350 townhomes (Village 35) and Tanglewood Estates single-family Hovnanian homes being built on Kings Highway East, we will be held hostage in this area. Image courtesy of Two River Times. 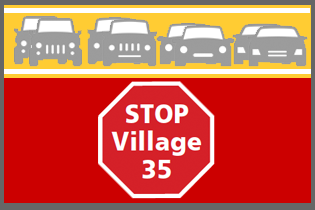 Click image to view the May 30, 2017 article by Jay Cook: "Traffic Congestion Tops List of Village 35 Fears." A Route 35 traffic study was requested by our group, Minding Middletown LLC, in a meeting with Tony Mercantante, the Township administrator, ​on April 5, 2017. VIEW WHAT WE REQUESTED TO BE INCLUDED IN THE TRAFFIC STUDY. 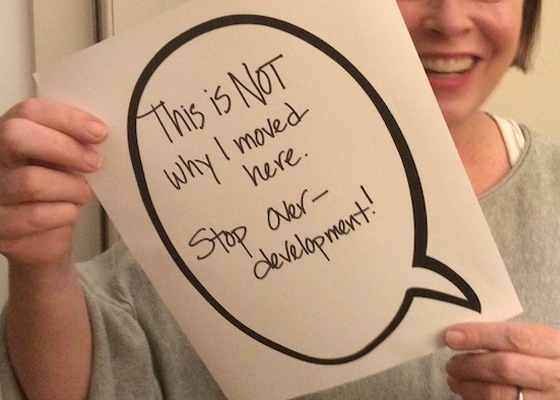 Please Contribute Here To Oppose Village 35. "The three-month hold placed on the Village 35 project wasn't just so the residential plans could catch up; it was because the township planning board had so many questions about the commercial portion, including the impact on traffic from nearly 340,000 square feet of new shopping. Board chairman John Deus told a capacity crowd at last week's meeting (Sept. 7th) that Village 35 — alternatively known as" the Shoppes at Middletown" and informally called "the town center" — wouldn't be considered for site plan approval until December's meeting at the earliest. In explaining the decision to delay to developer National Realty & Development Corp.'s executives and attorneys, Deus said that the board was expecting the application of Toll Brothers, a Pennsylvania contractor that is building 350 residential units in conjunction with the commercial space, would have caught up by now and could be reviewed in parallel. That didn't happen. However, Deus also pointed out that National Realty's application was still not acceptable in enough ways that it took the township's engineer 56 pages to list them in full. "In my soon-to-be 30-year term on this board I've never (seen) a 56-page review letter, ever," Deus said to Marc Policastro, National Realty's attorney, last week. The Asbury Park Press obtained the letter and it covers all aspects of the site plan — layout, drainage, environmental, landscaping — but 20 pages are spent solely on traffic questions. 2. 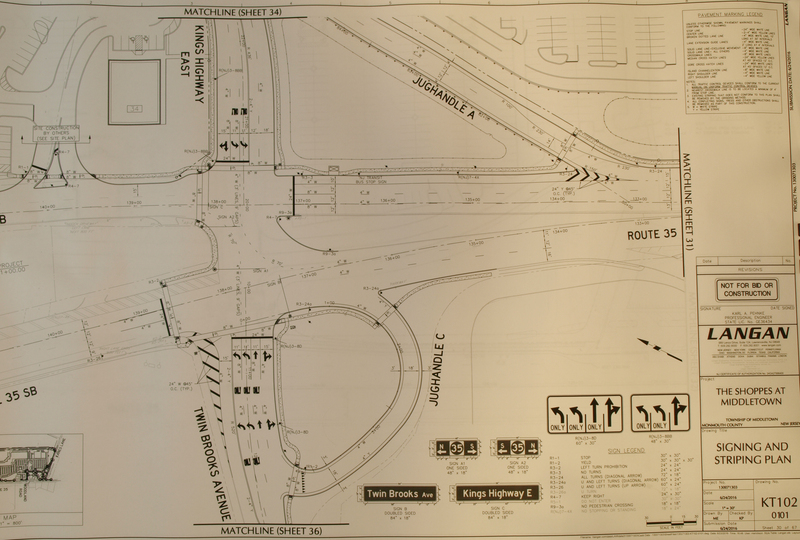 What improvements are going to be made at the Oak Hill Road/Chapel Hill Road intersection? The letter says that the National Realty team told the state in January that it would be changing this intersection with Route 35 to create two left-turn lanes and a through/right-turn lane. The traffic analysis is based off this modification. However, the developer also asked for a waiver from the state Department of Transportation that would exempt it from having to improve this intersection. The line of vehicles in this jughandle — looking either to turn onto southbound Route 35 or head straight onto Kings Highway — regularly stretches all the way back to the jughandle entrance, as the letter notes. Adding in the new traffic could extend that jughandle line and end up blocking the flow of traffic from Kings Highway East onto northbound Route 35." Click to view the Village 35 T and M August 25, 2016 Review Letter.